Every IoT platform must provide the ability to organize and manage solution assets in a flexible and intuitive way. Felix Manage provides service to support the management of tenants, users and “things” that make up an Internet of Things solution. Felix is a multi-tenant platform. With the tenant management services organizations can create tenants to match an existing physical entities (think tenant per plant for a national manufacturer) then manage these tenants individually and as a group. Users can belong to one or more tenants. A users access privileges and functional capabilities can be set and managed across assigned tenants. The Felix User management services makes managing users across an organization simple and intuitive. With hundreds, thousands and potentially millions of things making up a single IoT solution, management can quickly become a nightmare. 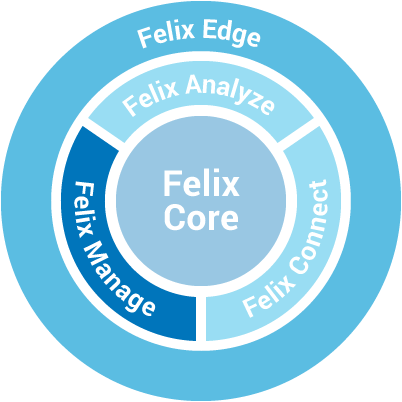 Felix thing management, in conjunction with Felix data collection services provides automated provisioning of things with Felix. Thing management services also allows for management operations to be performed on things grouped by type or tagged with a common identifier making the management of extremely large scale IoT deployments a feasible endeavor for an organization. Felix Management services allow for the flexible configuration and provisioning of tenants and users within an Felix IoT solution making it possible to model an organization in the most effective and efficient way. The Felix Manage service provide a fully functional and intuitive interface for managing tenants, users and things in an IoT solution. The services are also open and can easily be integrated into an existing management platform reducing or eliminating the need for retraining. With automated provisioning of “things’ and bulk management of devices, Felix management services leverage automation to drastically reduce the management burden of large-scale IoT solution deployments.